President Vladimir Putin has praised the reliability of Russian weaponry, while applauding the developers of the Kh-101 strategic air-to-surface cruise missile which has proven its effectiveness against terrorists in Syria. “I would like to thank both the military personnel and the designers and developers of one of our latest missile systems, Kh-101,” Putin said at a Meeting of the Commission for Military Technical Cooperation with Foreign State. “This missile system has proved highly reliable. It is indeed the most advanced weapon with high precision and capacity, and a range of 4,500 km, which is quite good,” he added, urging defense companies to step up production of modern weapons. Noting the growing demand for Russian weapons given their effectiveness in Syria, Putin stressed that the proliferation of military technology should in no way impact negatively on the strategic balance of power in regions where the weaponry is sold to. Instead of fueling conflict, the Russian leader emphasized, weapons should be used to prevent them. “All our decisions on supplies of arms to external markets are based on the current international situation in various regions – in order to prevent any imbalances and to avoid an escalation of conflicts. On the contrary, our weapons must be used to contain conflicts at the early stages,” Putin underlined. Putin also pointed out that the demand for “qualified military specialists” is on the rise. “In this context, the training of military personnel, teaching them to operate Russian weapons and equipment, and building up the export of military services, should remain a major component of the military technical cooperation system,” the Russian leader said. The Kh-101 missile, created by Raduga (Rainbow) Design Bureau, was first battle-tested in Syria in 2015, but the Russian military once again demonstrated its effectiveness on Wednesday, when Tu-95MS strategic bombers fired the missiles on Islamic State targets in Hama and Homs provinces. The Kh-101 carries a non-nuclear warhead of up 400 kg, while the Kh-102 modification can be armed with a 250 kiloton nuke. The missile can fly at an altitude of up to 10,000 meters, with an effective range of 5,500 kilometers, according to various estimates. One of the advantages of the missile which entered service in 2013, is that it can be carried by a wide range of aircraft. 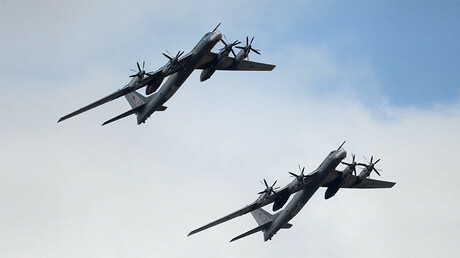 The supersonic strategic bomber Tu-160 can be loaded with up to twelve missiles, while Tu-95MS can carry eight warheads. The Tu-22 can pack four missiles, while Su-34 bombers can hold two.